Home Breaking Buddha History International Latest Mars Taaza Gautam Buddha Statue on Mars ??? 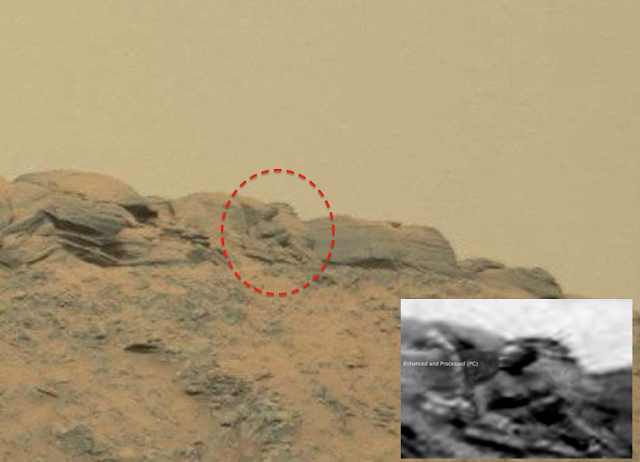 Gautam Buddha Statue on Mars ??? It's simply amazing - first they claimed that they found a helmet, then a rat and a woman, and now, well, the Buddha, himself, has been spotted on the Red Planet. UFO Sightings Daily, involved in researching on aliens, claimed to have seen a giant statue of Gautam Buddha on Mars. In the statue, as described by ufosightingsdaily.com, face and head are turned towards right and the chest and stomach are plump. The shoulders too are distinctly visible. According to the site, the red planet is full of relics and artifacts and signals that ‘intelligent life’ existed there. UFO Sightings Daily also claims that Martians knew all about religion and believed in life after death. Whether the statute is just a rock formation or real Buddha idol, it is definitely not clear by the pictures but yes, the news has surely excited many. This news about a Martian God statue on the Red Planet certainly tops the list of exciting space news this week. "Due to the poor quality of this NASA image, we have to rebuild it, using colorization techniques and a little artistic license. It would appear ... that Mars did, indeed, have an advanced culture, a culture intelligent enough to create monuments of their kings or gods," according to Paranormal Crucible.